Mark Arthur van Loon Schneider was born August 16, 1919 in Wilkes-Barre, Pennsylvania, an industrial coal town in Luzerne County. His father, Frederich Stephen Schneider, was born in 1893 in PA of German ancestry. His mother, Helen van Loon Rice, was born in 1897 in PA of Dutch ancestry. His parents married in 1918. He was their only child. They lived at 191 North Washington Street. The father was a traveling salesman of home furnishings. In 1920 the family moved to Dallas, Texas, where they lived on Prairie Street with the widowed maternal grandmother, Elizabeth Rice, who was born in 1870 in PA. She worked in a hair parlor as a beautician. In 1925 the family returned to Wilkes-Barre, PA, where they lived at 72 West Union Street. The widowed maternal grandmother continued to live with the family. From an early age Mark Schneider was interested in art. His father taught him the basic skills, but in 1936 at the age of sixteen he began to take weekend art lessons from a local artist, James Rutter (1888-1960), a portrait painter and photographer. In 1937 at the age of seventeen he won an art contest for readers of the juvenile magazine, Open Road For Boys. In June of 1938 he graduated from James M. Coughlin High School in Wilkes-Barre, PA. In August of 1938 he moved to New York City to study at the Art Students League and to seek his fortune as a commercial artist. He lived in a boarding house at 53 West 52nd Street, while art school was only five blocks away at 215 West 57th Street. One of his instructors was George Bridgman (1865-1943). Another art student, Howard Purcell (1918-1981), was his roommate. He was born November 11, 1918 in Portland Oregon. They split the cost of their monthly rent, which was $38. Howard Purcell went on to his own distinguished career as an industrial designer. 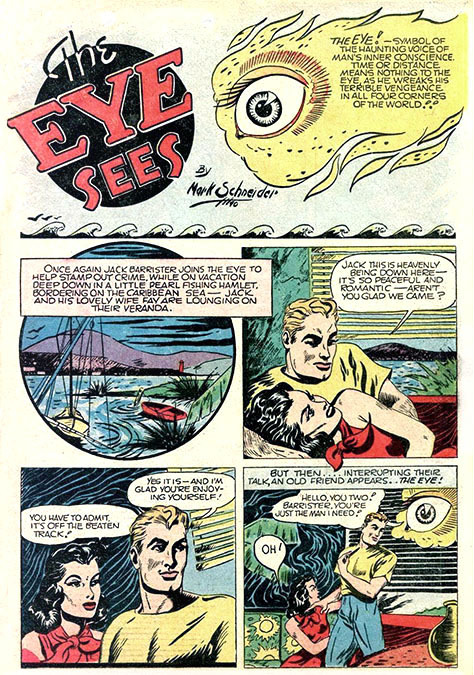 By 1939 Mark Schneider found work in the growinghn comic book industry. His first employer was Joseph Hardie of Centaur Publications, at 215 Fourth Avenue at 14th Street and Union Square, where they produced Keen Detective Comics and Detective Eye Comics. 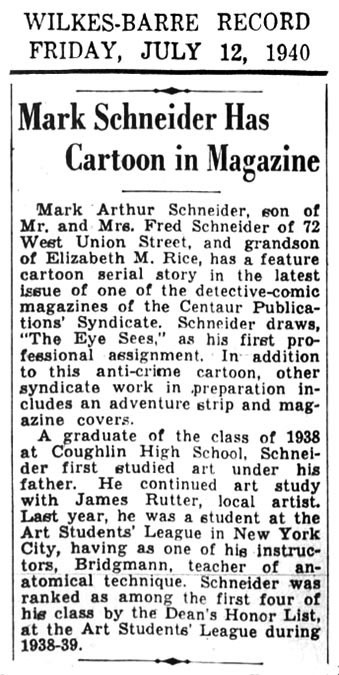 On July 12, 1940 the Wilkes-Barre Record newspaper reported, "Mark Arthur Schneider, son of Mr & Mrs. Fred Schneider of 72 Union Street, and grandson of Elizabeth M. Rice, has a feature cartoon serial story in the latest issue of one of the detective comic magazines of the Centaur Publications Syndicate. 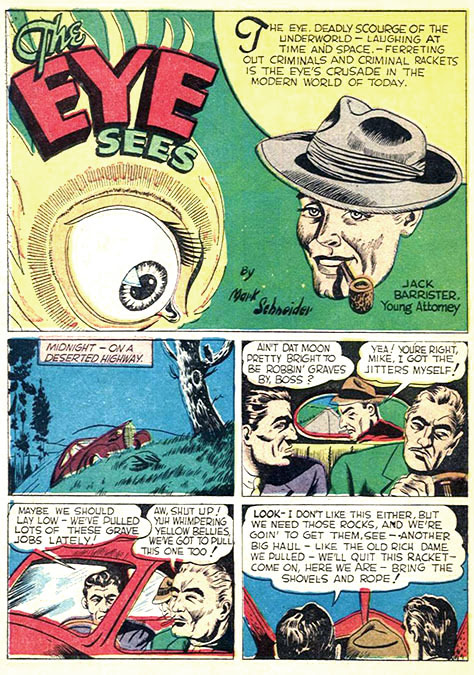 Schneider draws, 'The Eye Sees,' as his first professional assignment. 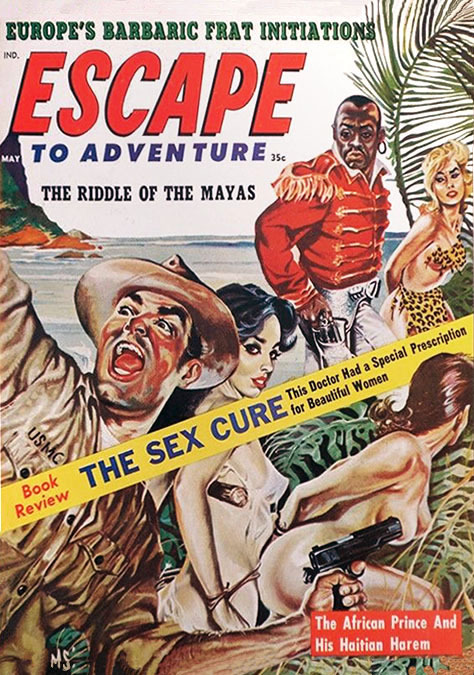 In addition to this anti-crime cartoon, other syndicate work in preparation includes an adventure strip and magazine covers." 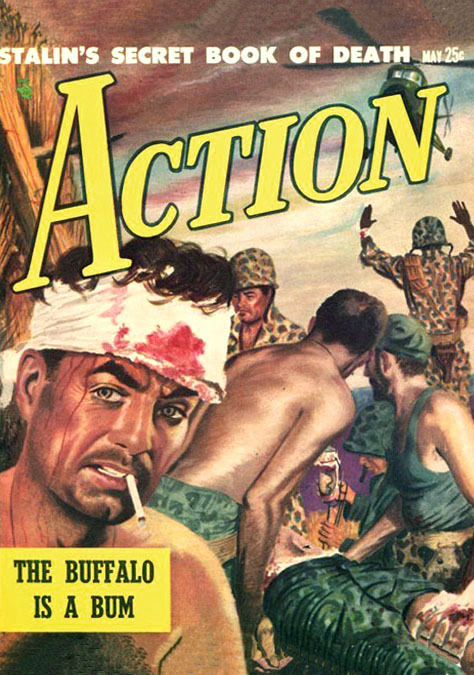 He went on to draw comics for Ace, Dell, Fawcett, Novelty, and Street & Smith Comics, for which he drew "The Avenger." 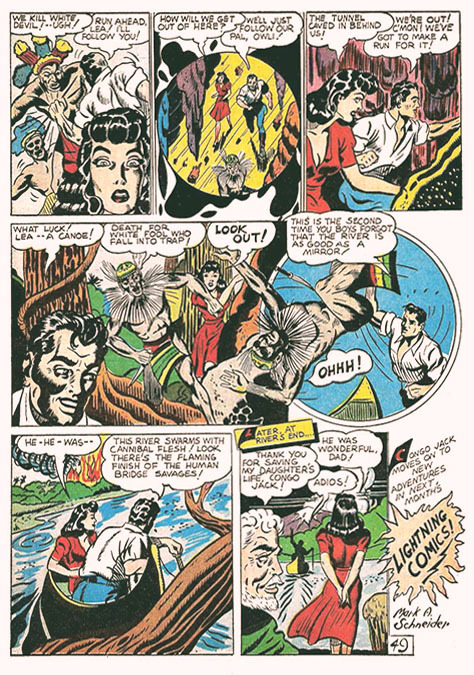 In 1941 he was hired as a staff artist at Fawcett Publications. Two months after the infamous attack of the Japanese on Pearl Harbor he joined the army on February 12, 1942. He was recorded at the time to be an unmarried "commercial artist." five-foot-ten, and weigh 150 pounds. he served in the 271st Infantry Regiment, Cannon Company, Ordinance. He served in North Africa, Sicily, France and Germany. He was promoted to the rank of Sergeant Tec-5. 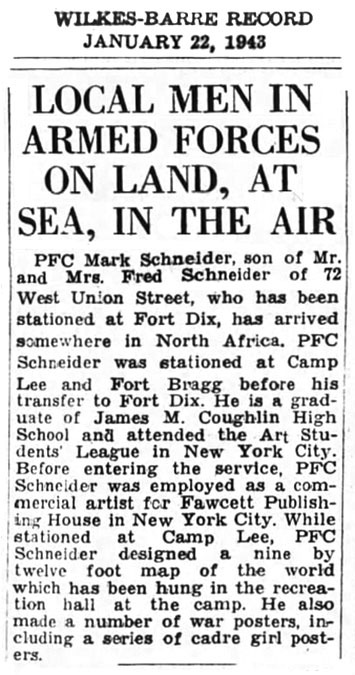 On January 22, 1943 the Wilkes-Barre Record newspaper reported, "PFC Mark Schneider, who has been stationed at Fort Dix, has arrived somewhere in North Africa. He received basic training at Camp Lee, Virginia, and Fort Bragg, North Carolina, before his transfer to Fort Dix. While stationed at Camp Lee, PFC Schneider designed a nine by twelve foot map of the world which has been hung in the recreation hall at the camp. 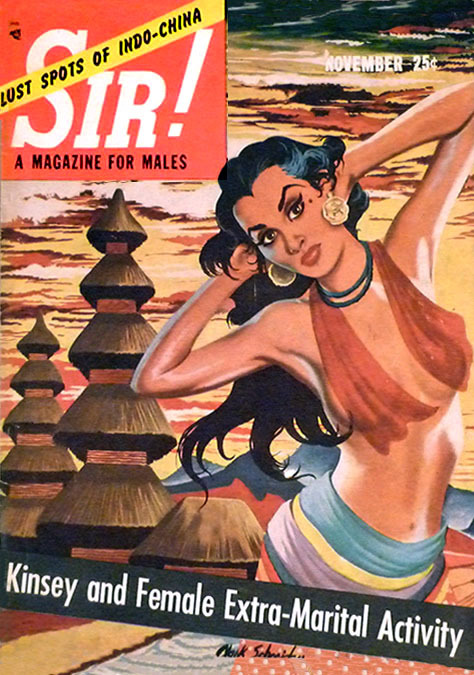 He also made a number of war posters, including a series of cadre girl posters." 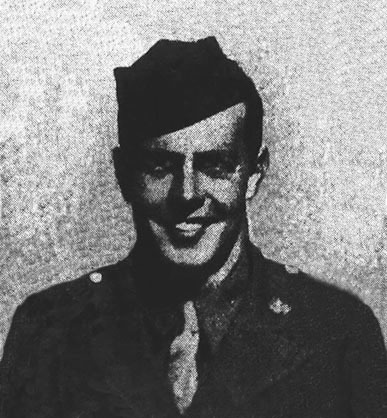 On February 15, 1945 the Wilkes Barre Record newspaper reported,"Corporal Mark Schneider has been in the armed forces three years, celebrating the anniversary Monday. 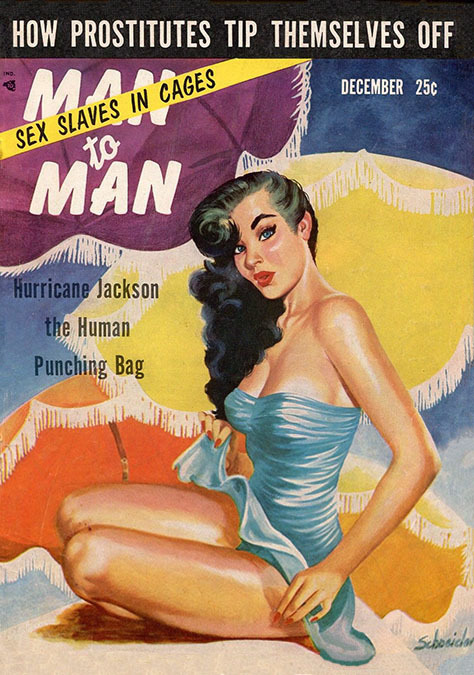 A commercial artist with a publishing firm in New York City before entering the armed forces. Corp. Schneider is with an ordinance unit of the Seventh Army in France. he has been overseas since October of 1942, and took part in the African, Sicilian, and Italian campaigns." In September of 1945 he returned stateside on the luxury ocean liner Steam Ship Queen Elizabeth, which served as a troop transport. He was honorably discharged on September 30, 1945. He returned to live with his parents in Wilkes-Barre at 72 West Union Street. In January of 1947 he moved to New York City, where he lived at 60 East 78th Street, to resume his career as a commercial artist. 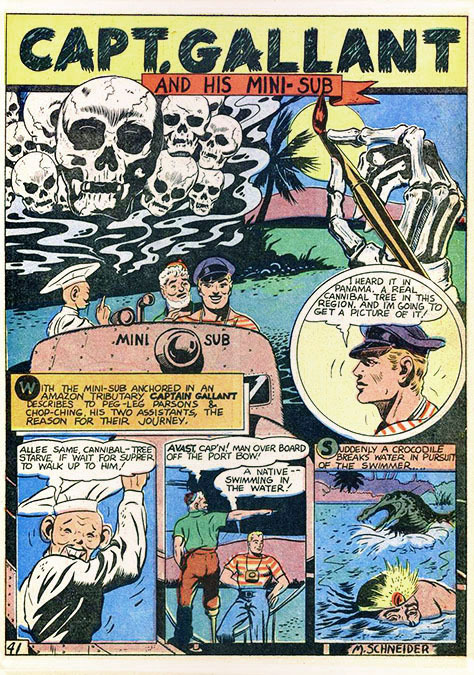 His first work was for Avon Comics and Youthful Comics. 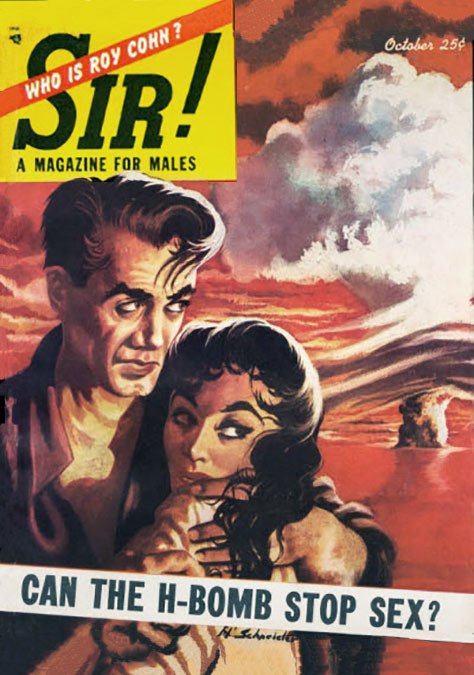 He signed his post-war comic book work "M.S." He continued to visit his parents in Wilkes-Barre, PA, on holidays and weekends for the rest of his life. On August 17, 1955 his mother, Helen van Loon Rice Schneider, died at the age of fifty-nine in Pennsylvania. 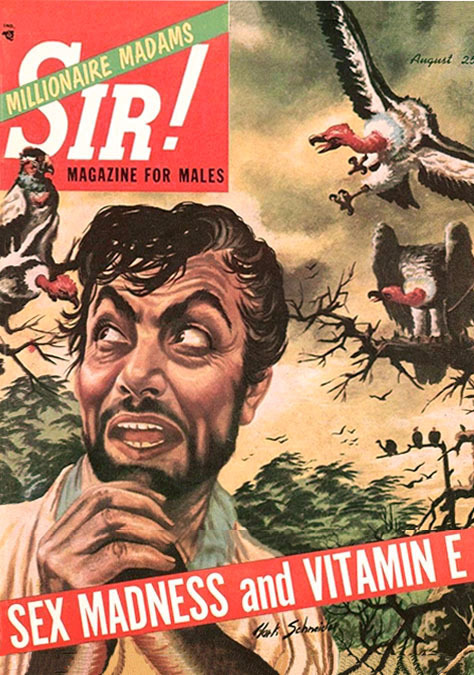 He painted covers as well as black and white interior story illustrations for mens adventure magazines. 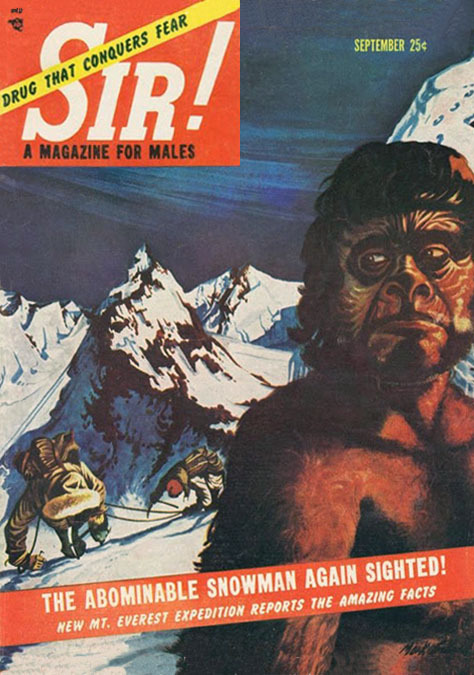 His work appeared in Action, Escape To Adventure, Man To Man, and Sir! In 1960 he lived in Manhattan at 112 East 36th Street. On March 1, 1980 his father died at the age of eighty-six in Pennsylvania. Mark Schneider died at the age of sixty-three in New York City on December 11, 1982.